The cold, icy weather conditions we've just come through (with more forecast soon) might have some seniors (or their families) starting to wonder if perhaps looking at a Retirement Residence might be worthwhile. You can enjoy Independant Living or Assisted Living in the right Residence and leave the snow shovelling, grocery shopping/ loading and home maintenance to someone else! The best thing to do is book tours at different residences to see what they offer before it's an emergency situation. Give yourself time to consider the different options and plan ahead. 1) Is there an ATM where I can get cash in the building or close by? 2) Are there private mailboxes? Can I receive FedEx etc. deliveries? 3) What arrangements do you make for smokers? 4) Is wine or beer available at meals or in the lounge? Is the residence licensed? 5) Is seating assigned for every meal? 6) Are pets allowed to live here and/or visit? 7) What's the procedure for aging in place? What medical conditions are accepted? 8) What changes,if any,may I make to my suite - paint, wallpaper, flooring, etc? 9) Do suites have WiFi, cable and phone jacks? 10) Is there a recent Resident Satisfaction Survey available? 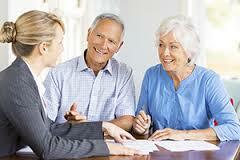 If you think selling your home and moving to a retirement residence is the next step, feel free to get in touch. I'm happy to help.